I was looking through some of my image folders that I’ve saved for blogging and realized how many ways I change up the Caprese style salad. I’m a huge fan of avocado and particularly love it due to its mild, buttery flavor and rich texture. I’m still surprised when someone says they are not a fan and my husband Bill is one of those guys. These days, the avocado has become an incredibly popular food among health conscious individuals. It is often referred to as a superfood, which is not surprising given its health properties. Consuming fruits and vegetables of all kinds has long been associated with a reduced risk of many adverse health conditions and if you think about everything that goes into most Caprese salads are really good for you! 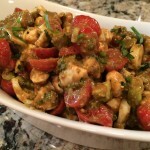 I tend to call a lot of my salad creations Caprese’s when they really aren’t. The Caprese salad is a simple Italian salad, made of sliced fresh mozzarella, tomatoes, and basil, seasoned with salt, and olive oil. I change the salads up based on ingredients that I have on hand and often add hard boiled eggs, nuts, fresh herbs and other vegetables. I love to incorporate the avocado. Did you know that they contain more potassium than bananas and are loaded with fiber? 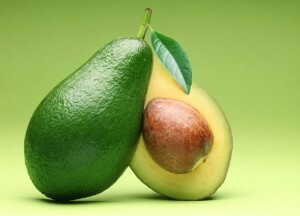 I’ve also read that eating avocados can lower cholesterol and triglyceride levels. This would be good for my Bill! That’s not the only healthy thing about a salad! Tomatoes can help combat the formation of free radicals known to cause cancer because they are an excellent source of the strong antioxidant vitamin C. I often incorporate beets, which are high in immune-boosting vitamin C, fiber, and essential minerals like potassium (essential for healthy nerve and muscle function) and manganese (which is good for your bones, liver, kidneys, and pancreas). More than not, I place these “good for you” foods on some leafy greens like Spinach, a super food loaded with tons of nutrients; or arugula, that contains very high nitrate levels have been shown to lower blood pressure, and reduce the amount of oxygen needed during exercise and enhance athletic performance. Olive oil is a must and though it may be filled with fat, the main type is monounsaturated fatty acids (MUFAs). And according to the Mayo clinic, MUFAs are actually considered a healthy dietary fat that has been found to lower total cholesterol and low-density lipoprotein cholesterol levels. If the salad isn’t topped with Extra Virgin Olive Oil and Balsamic, I almost always reach for my house made Thyme vinaigrette. I’ll share a few ideas of some recent salad varieties. 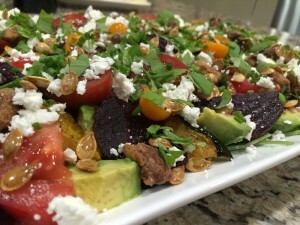 You can create salads using fresh ingredients that are in season! Below, I used some roasted butternut squash (leaving the skin because it’s full of nutrients! ), roasted squash seeds and beets, avocado, seasonal cinnamon flavored nuts and goat cheese with fresh basil. I topped this one with my vinaigrette. 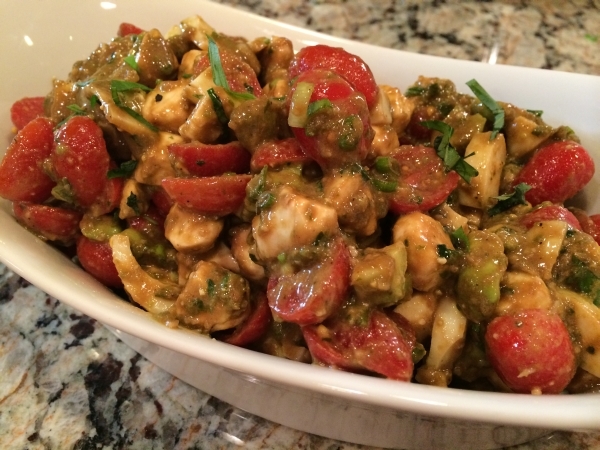 On the next one I used some small grape tomatoes, cubed hard boiled eggs, small mozzarella balls and green onions. 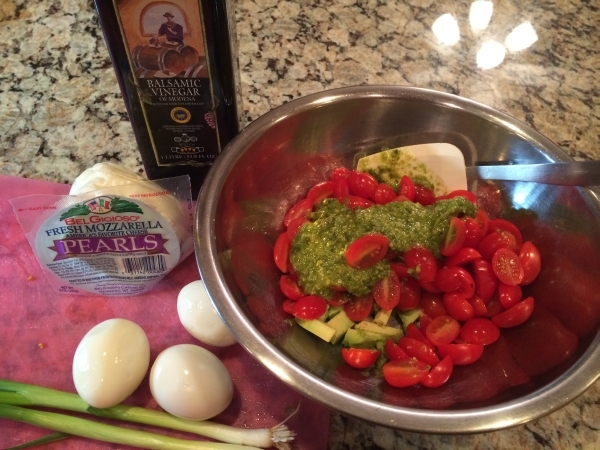 I just tossed in some ready-made pesto and good balsamic. I absolutely love Buratta. 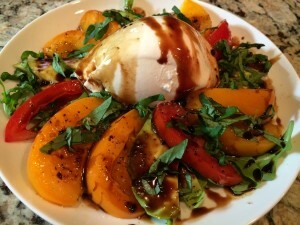 Below is a nice Caprese salad with Burrata and balsamic. 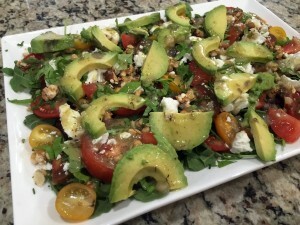 The salad below has many of the same ingredients of a Caprese, but it is all on top of the greens and is utilizing goat cheese with no balsamic. 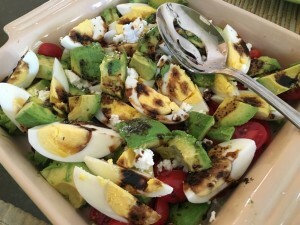 On a recent trip with the girls, Jen put this salad together, which had fresh tomatoes, hard boiled eggs and avocados. 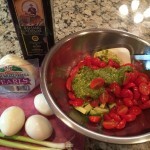 She topped it simply with a reduced balsamic and extra virgin olive oil. Today happens to be Bill’s birthday and when I asked him what he would like for lunch? He replied “Salad?” so I decided to add some pan seared chicken tenderloins, to the fresh greens adding a bit of cranberry and pistachios; topped with the vinaigrette! So go ahead! 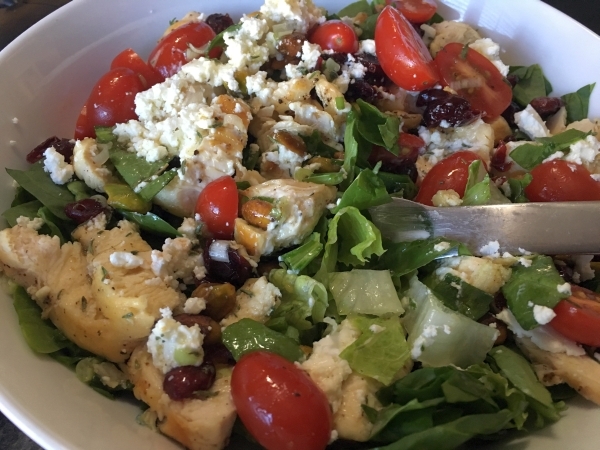 Change up your salad and make it your own!